The second Masters 1000 event of the season in Miami will host the best players in the world (not all of them, though) at Hard Rock Stadium instead of Crandon Park in Key Biscayne where it stayed for decades. The home of the NFL’s Miami Dolphins is redesigned to offer the best possible facilities for both the players and fans on 30 blue-painted hard courts. Since the start of Masters 1000 series in 1990, Miami has been among the most significant events in the calendar and the list of champions includes just a few players who weren't ranked No. 1, including the last year's winner John Isner. Novak Djokovic and Andre Agassi are the most successful players in Miami, both winning six titles, and the Serb will chase the seventh next Sunday, leading the draw as the top seed after an early exit at Indian Wells. Novak will face Bernard Tomic or Tomas Berdych in the second round before the potential clash against Roberto Bautista Agut or Fabio Fognini for the place in the quarters. There, Novak could face Milos Raonic, the defending champion John Isner or Kyle Edmund and he should reach the semis if he brings his 'A game.' 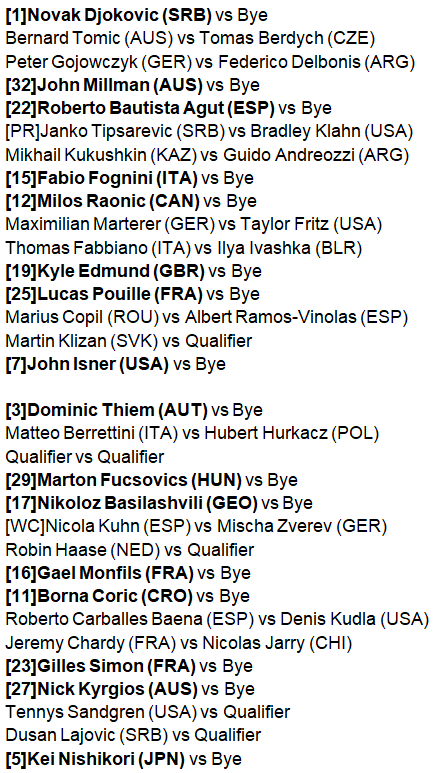 Indian Wells champion Dominic Thiem is the 3rd seed and he kicks off the campaign against Matteo Berrettini or Hubert Hurkacz before the possible clash against Gael Monfils who had to withdraw before their quarter-final duel at Indian Wells. 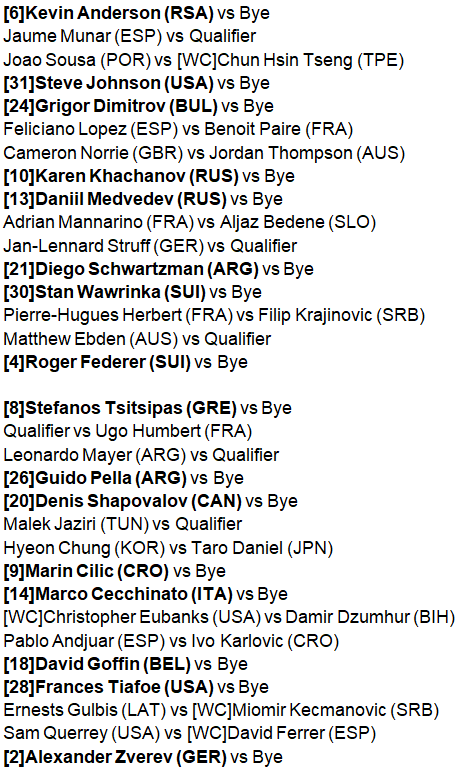 Borna Coric, Nick Kyrgios, Gilles Simon and Kei Nishikori are also in the second quarter and it should be interesting to see who will reach the last four and face Djokovic there. After skipping all the action after the Australian Open, Kevin Anderson should be on the court again, seeking the quarter-final spot against the names like Grigor Dimitrov, Karen Khachanov, Feliciano Lopez or the top-ranked junior Chun Hsin Tseng who is making his ATP debut in Miami. Daniil Medvedev, Stan Wawrinka and Roger Federer are in the third quarter as well and we will follow closely if Roger can continue where he left at Indian Wells and have another deep run at Hard Rock Stadium. Stefanos Tsitsipas, Denis Shapovalov, Marin Cilic and Alexander Zverev should be the players to beat in the bottom quarter and the crowd will have a chance to watch many interesting encounters right from the opening round.